Lake Arts Project presents “The HeArt of War.” For this collaborative multi-arts dance performance, we’ve teamed up with Feast of Crispian, for the second time, Milwaukee Ballet School & Academy, and with MPS Alliance School. The personal stories of trauma, challenge, and personal courage of these veterans and students are powerful and inspiring. 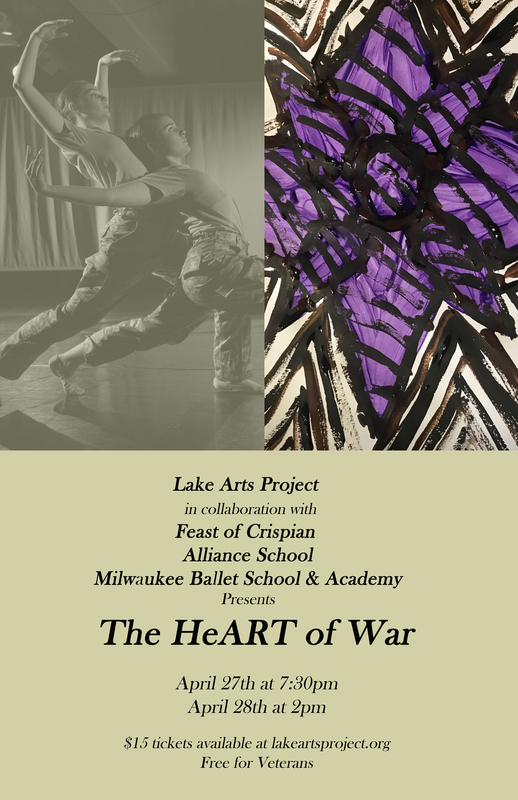 Lake Arts Project has put these stories on the stage for you with original choreography, based on their testimony, visual art, writing, and original musical compositions. Interested in producing your own show at the Danceworks Studio Theatre? Contact Kim Johnson, Senior Director of Programs, via email or at 414.277.8480 x6018. These projects are supported in part by a Danceworks Space Grant. The Danceworks DanceLAB continues its mission to support local artists by offering Space Grants for independent choreographers who would like to produce their own shows in the Danceworks Studio Theatre, or develop their own new work.